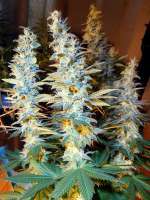 Here you can find a strain description about Blue Hell (MedicalSeeds) and also some user-based reviews and infos directly from the SeedFinder (if available). You can also find the offers and auctions here if Blue Hell (MedicalSeeds) cannabis seeds are on stock at MyCannapot right now. Indoor vegetative period: 3 to 4 weeks. Indoor flowering period: 9 to 10 weeks. Indoor production (per m2): 450 grams. Outdoor height: 1.5 to 2 m.
Outdoor flowering period: Early October. Outdoor production: 500 to 750 grams. Variety created from selected DJ Short: seeds, chosen for its production and its berries flavour, it is one of the best Indicas available. Highly medicinal effect, with high CBD concentration and medium THC percentage. Suitable for people suffering from physical or chronic aches, it is a safe choice for production and quality. Initiation of flowering onto around 35 cm. - Final Height onto around 110 cm. Affects / helps in average doses well at / against Movement Disorders. Affects / helps in average doses very well at / against Spasticity. Affects / helps in average doses low at / against Pain. Blue Hell (MedicalSeeds) is not available at our shop at the moment!